Ghost Upon the Floor: Pumpkin Patch Update: More flowers! 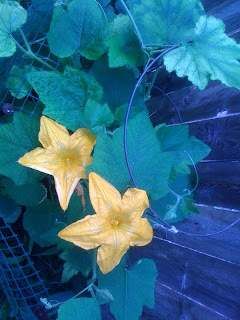 My pumpkin patch is continuing to bloom. The patch continues to spread outward, and vine both out and up. Flowers are blooming everywhere. This weekend I am going to build a shelter for the top, to protect the patch from too much sunlight.